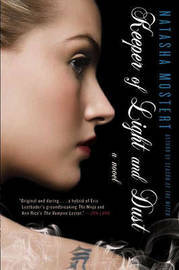 Read Natasha Mostert's posts on the Penguin Blog. From the acclaimed author of "Season of the Witch" comes a supernatural thriller blending magic, science, and martial arts with a unique vampire hunter heroine. Mia Lockhart is descended from Keepers-women who were warriors, healers, and protectors in ancient times. But as Mia practices her craft in South London, she has no idea she is being watched. Adrian Ashton is a brilliant scientist. He is also a skilled martial artist-and a modern-day vampire. He has mastered the art of draining the chi of his opponents-the vital energy that flows through their bodies. And Mia finds herself drawn to his dark genius, though she has given her heart to another... When Ashton targets the man she loves, Mia is forced to choose between them-and the choice results in a fight to the death in which love is both the greatest weakness and the greatest prize. Natasha Mostert is the author of four novels, "The Midnight Side, The Other ""Side of Silence," and" Windwalker, "and "Season of the Witch." Educated in South Africa and at Columbia University, New York, Mostert holds graduate degrees in lexicography and applied linguistics and bachelors in Modern Languages majoring in Afrikaans, Dutch, English and German. Her political opinion pieces have appeared on the op-ed page of "The New York Times," in "Newsweek," "The Independent" and "The Times" (London). She lives in London.